The endorsement is the first for MoveOn this cycle and the top-priority Senate race for MoveOn; there are more than 150,000 MoveOn members in Wisconsin. 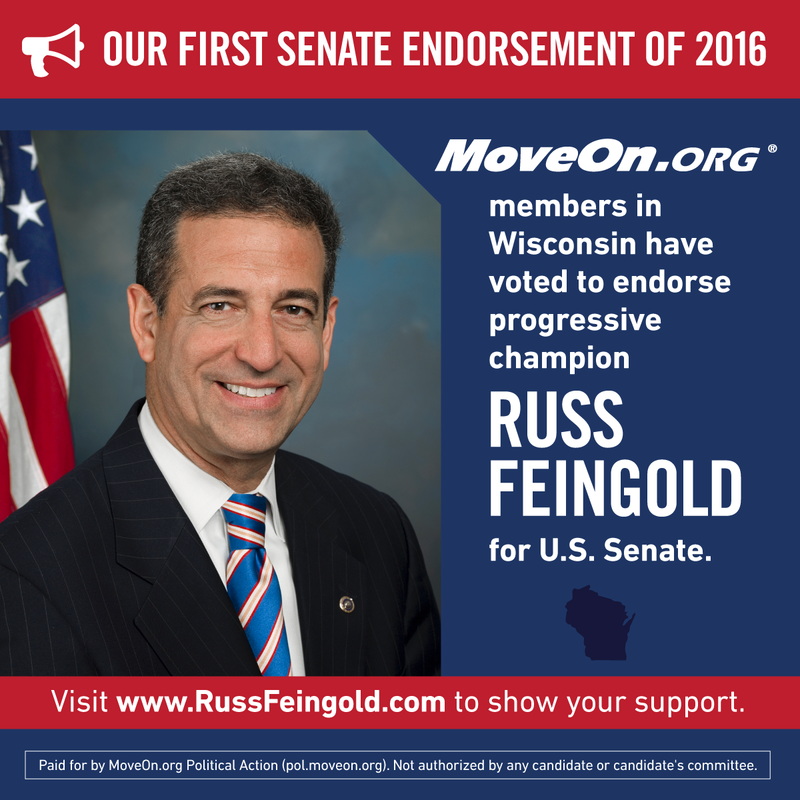 WISCONSIN — Wisconsin members of MoveOn.org Political Action have voted decisively to endorse progressive champion Russ Feingold in the state’s U.S. Senate race, with an overwhelming 98% of votes cast in favor of backing Feingold. The endorsement is the first by MoveOn members in the 2016 cycle. MoveOn has more than 150,000 members in Wisconsin. Feingold was one of the most principled progressives in the U.S. Senate, where he served for 18 years until he was caught up in the Tea Party wave of 2010. From his sole vote against the Patriot Act in 2001, to coming out early and strongly against the Iraq War, to being a leading voice for getting money out of politics, Feingold has been a vocal and tireless advocate for progressive values and the people of Wisconsin. In 2010, MoveOn members contributed more than $600,000 in small-dollar contributions to Sen. Feingold’s campaign and mobilized hundreds of volunteers across the state. In the 2014 election cycle, MoveOn members made over 6.7 million phone calls for endorsed candidates. MoveOn members have also raised millions of dollars—including more than $1 million for Sen. Elizabeth Warren’s Senate race in Massachusetts in 2012—mobilized volunteers, and run ads in support of endorsed candidates across the country. Nationwide, there are 8 million MoveOn members.